Photo snapped aboard Irish Rail with Lumia 1520. 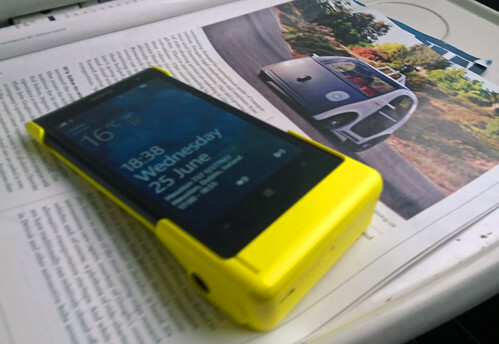 I SPENT A WEEKEND without Windows Phone 8.1 and realized that the Lumia 1020 in the photo needs three software functions to bring it up to my Lumia 1520. Notifications Screen. With WP 8.1 I can pull down any screen and see notifications related to incoming mail, social networks and system alerts. The notifications are more customizable than I get with my wife's iPhone 5 and the email notifications arrive faster than I get with KitKat on my Sony Xperia. Cortana while driving. With my Lumia 1520 tucked in the boot and connected to the Nissan Qashqai by Bluetooth, the car reads out the name of incoming callers and it also reads text messages out loud. I can listen to texts while driving when the car is connected to Cortana. I can dictate text messages by speaking them out loud at 100 kph. I can create two sentences of email while dictating and driving. Doing these things may equate to distracted driving but there is no screen to touch through the whole process. Uncompressed 96 kHz Recording. The Lumia 1520 is the best audio recorder I have owned. While it does not require WP 8.1 to get basic audio recording capability, several of the auto-sync functions leverage WP 8.1 and OneDrive. I'm back with Lumia 1520 and WP 8.1, happy to have experienced withdrawal symptoms while the phone was remotely recording interviews in Kilkenny. It spent several productive hours last week poking out of my coat pocket during the Dublin e-learning summer school #elss14. You can listen to those segments on http://audioboo.fm/topgold and to frequent Lumia audio logs posted there.